Wizard of Oz slots are The most successful series in WMS history. And they’ve been making slots for decades. Zeus slot machines are also extremely popular, but Wizard of Oz are the all-time #1. Currently there are 4 Oz themed slots you can find online. The original Wizard of Oz slot machine, which was followed by Wizard of Oz Ruby Slippers, Wizard of Oz Wicked Riches. and lately by Road to Emerald City slot. Here on SlotMachinesOnline.co, you can find dedicated reviews of each of the three slots and also play them for free. On this page, we will try to summarize the differences and the pros and cons of each slot. We usually don’t start our reviews with the bet limits, but here we find it appropriate due to the enormous differences between the slots. Wizard of Oz slot is by far the best for penny slots and high limit slots fans alike. It allows you to place a minimum bet of just 1 cent per spin, while the maximum goes as high as $150. Ruby Slippers also allows 1 cent per spin bets, but the maximum goes up to $60. Unlike the first two, Wicked Riches sets very narrow bet size limits. The minimum bet per spin is $0.30, while the maximum set on $2.40 per spin. A bit disappointing. Naturally, the design of Wizard of Oz slots developed with the years. 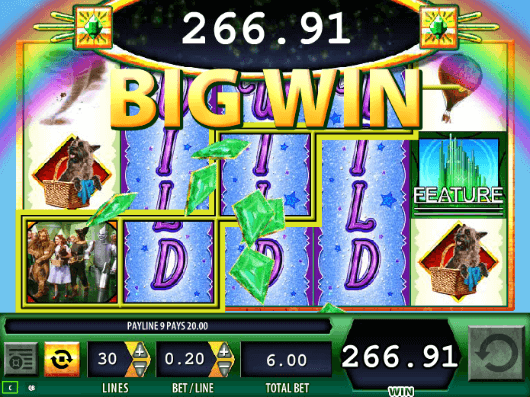 The original game has this classic Vegas slot look & feel, with the characters from the famous Wizard of Oz movie. Wicked Riches, the latest of the three, is an edgy new slot with 4 jackpots, black – blue – purple design and special visual effects. Ruby Slippers is somewhere in between. It’s not classic and yet it doesn’t feel up-to-date, therefore it seems to be the weakest in terms of design. At least for me. Wizard of Oz slots are very rich in terms of bonus features. They all have 3 special bonus games, but how they work vary from one game to another. 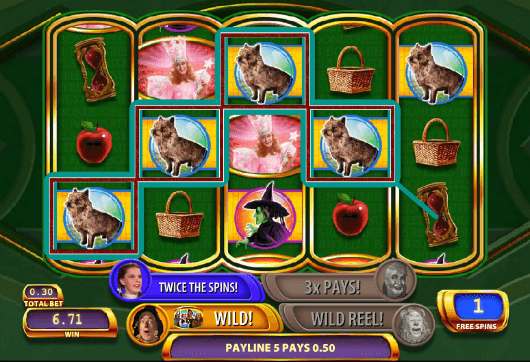 Another bonus feature which Wizard of Oz slots offer is a Pick Me style bonus. It triggers differently on each game and the reward also varies from one to another. On the original game it servers as a preview where you can choose between the Free spins bonus and the Emerald City bonus. On Ruby Slipper you will need to find the Broom, which will reward you with x50 your total bet per spin. On Wicked Riches it will lead you to the 4 Special Jackpots. Cool bonus feature which you can find on the original Wizard of Oz slot and on Ruby Slippers. When triggered, it will turn from 1 to 4 reels completely Wild, creating multiple winning combinations, usually with a multiplier. All three slots have a special Jackpot symbol with wins you the Jackpot. On Wizard of Oz and Wicked Richers it’s worth 10,000x your bet per line. On Ruby Slippers it goes up to 12,000x your bet per line. 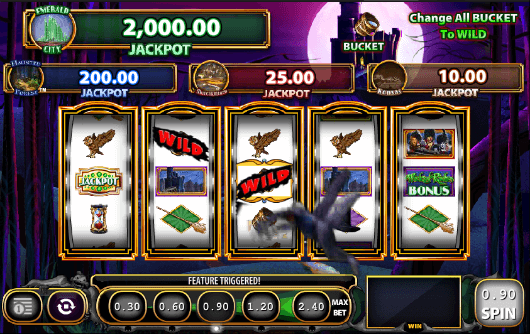 Besides the regular Jackpot, Wicked Riches also offers a Tornado bonus game with 4 jackpots. The highest, Emerald City, is worth $2,000. If you’ve been playing Wizard of Oz slots in any land based casino, you will immediately notice that the online versions are not an exact copy of the offline slots. 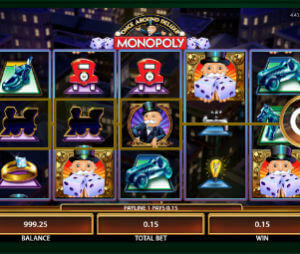 In my opinion, the offline slots are slightly better, but you are compensated with the higher return of the online slots. The RTP of Wizard of Oz online slots is 96%,. The return of land slots varies according to your country and state, but in average stands somewhere between 88%-94%. It’s impossible to name the best Wizard of Oz slot. All of them are extremely fun, full with multiple bonus features. The only big difference is the bet per spin limits and if you prefer to bet few cents per spin or $100+ per spin, then the original Wizard of Oz is the natural choice. Otherwise, you will just have to try and see which one you like. Have Fun!